History Day | Colorado Mesa Univ. Every spring, Western Slope History Day brings students from across the Western Slope to Grand Junction to have their entries judged by upper division Social and Behavioral Sciences students, faculty, and local citizens from the Grand Valley. 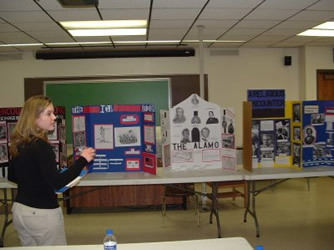 History Day is a national competition that provides students in grades 6-12 with an exciting way to learn about historical issues, ideas, people, and events. It meets many of the Colorado Model Content Standards in History, Geography, Civics, Economics, and Reading/Writing. Students acquire higher-level research and analysis skills as they prepare their entries. They select a topic based on the annual theme, do in-depth and balanced research, and develop a documentary, exhibit, performance, historical paper, and website categories for competition entry. At each level of competition, students present their entries and are interviewed by judges mainly from the Colorado Mesa University community. Winners at the local competition go on to compete at the State level at the University of Colorado at Denver. Winners at the State level, in turn, compete at the National History Day competition held annually at the University of Maryland at College Park. Thus far, we have had one student from the Western Slope, from Gunnison High School, to compete in the national competition in Maryland. For more information: please contact Dr. Vincent Patarino.